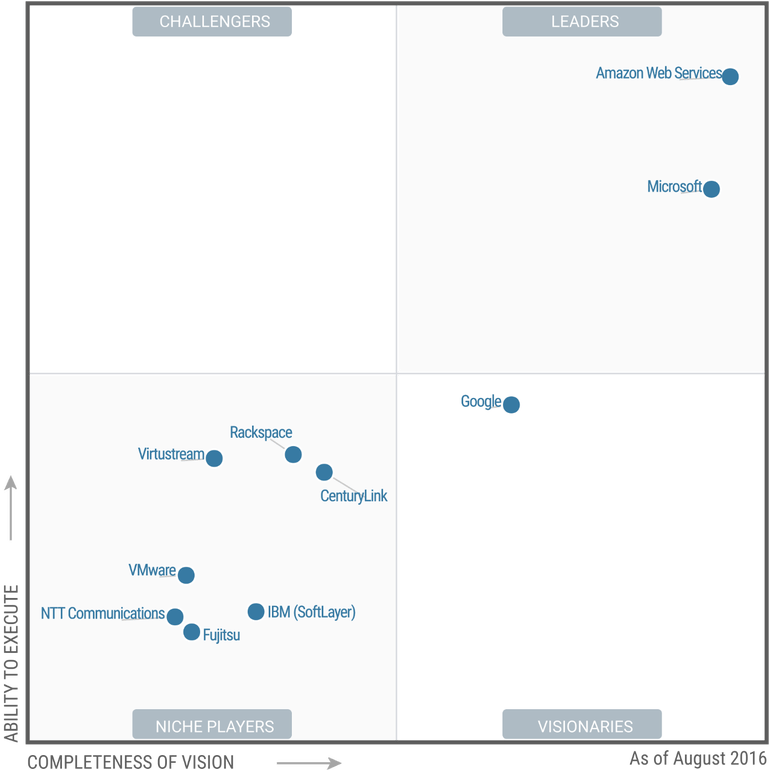 Amazon Web Services and Microsoft placed No. 1 and No. 2 in Gartner’s Magic Quadrant for cloud infrastructure services with Google moving up to visionary status. Here’s a look at Gartner’s Magic Quadrant on IaaS. The research firm’s graphical ranking of markets is influential yet derided at times for methodology. No matter where you fall your Magic Quadrant (MQ) spectrum it is closely watched. Gartner’s ranking only focuses on infrastructure as a service and doesn’t cover cloud storage, platform as a service, software as a service and cloud service brokers. The report also doesn’t cover the hybrid market. In the context of this Magic Quadrant, cloud compute IaaS (hereafter referred to simply as “cloud IaaS” or “IaaS”) is defined as a standardized, highly automated offering, where compute resources, complemented by storage and networking capabilities, are owned by a service provider and offered to the customer on demand. The resources are scalable and elastic in near real time, and metered by use. Self-service interfaces are exposed directly to the customer, including a web-based UI and an API. The resources may be single-tenant or multitenant, and hosted by the service provider or on-premises in the customer’s data center. Should your business retain its in-house data centre or outsource it to a service provider? What are the drivers and barriers when it comes to cloud infrastructure? What kinds of workloads are best suited to cloud deployment, and who are the leading cloud platform providers? We look at recent recent research on these important IT architecture questions. AWS has a diverse customer base and most use cases. AWS is also mature, but requires expertise to operate and buyers need to seek out sales and architecture engagement. Customers also have trouble getting into the deep range of services. Microsoft integrates infrastructure and platform as a service best and has better integration. Gartner also gave Microsoft props for being more open and being a good enough option to AWS. The knocks against Microsoft Azure are documentation, support and an ongoing build out. In addition, partners lack expertise in deep integration tasks. Google is viewed as a good option for big data and batch computing. Gartner said Google’s vision was a strength and it understands cloud native apps well. Google also has machine learning and analytics chip. The rub is that Google doesn’t have a feature set to match leaders and has trouble engaging with enterprises and midmarket companies. Beyond those big three cloud providers, Gartner lumped other infrastructure players into one area. For instance, IBM has customer relationships and brand, but is seen as a hosting-scale provider. Gartner also said IBM hasn’t boosted its SoftLayer feature set. Other players were also a mixed bag, but Gartner noted that Rackspace, CenturyLink and Virtustream all had notable strengths.